National Council of Jewish Women (NCJW) is a volunteer organization that has been at the forefront of social change for over a century. Inspired by Jewish values, NCJW takes a progressive stance on issues such as child welfare, women’s rights, reproductive justice and human trafficking. 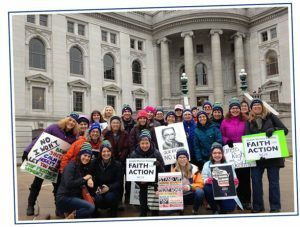 Locally, NCJW-MKE has been the gateway for Milwaukee’s Jewish community to live their values through advocacy and service. We embrace women and men of diverse backgrounds who want to make positive change at the local, national and global level. Our largest local service project is Home Instruction for Parents of Preschool Youngsters (HIPPY). NCJW-MKE brought this home-based literacy and school readiness program to Milwaukee in 1999 in partnership with COA Youth & Family Centers. The program now serves approximately 300 families each year and continues to grow. Our members are seasoned activists working beside those just putting their toes into the waters of community involvement. We work hard to achieve our goals, enjoy expanding our circle of friends and have fun along the way! Join NCJW today, and you will impact your community and the world at large by becoming part of a growing grassroots network of courageous and compassionate individuals who improve the lives of women, children, and families. For more information contact Andrea Bernstein at president@ncjwmke.org.